The new update is out today for PC and PS4. Fixed issue where player bases were given the name “Unknown Base” rather than a generated name. Fixed S-class ships having incorrect pricing and numbers of slots. Added rockets to starting ship in creative default save game. Added new icon for solo difficulty AI ships. Fixed Albumen Pearl plants using the wrong name on their interaction labels. Fixed the landing marker being visible in some fighter cockpits. Fixed texturing issue seen with some combinations of AMD GPU and drivers. Added and improved audio at the ending of the Atlas path. Added and improved audio for terrain editing. Improvement to vehicle boost timings. Made marker for rare graves stay up for the same time as other object markers. Prevented trees in frozen biomes spawning close to or intersecting buildings. Fixed issue where travelling through the centre of the galaxy could sometimes take you back to the same galaxy. Fixed issue where mission waypoints on the galactic map would not be for your current mission. Improved UI error messages relating to missions on the galactic map. Improved ship speed output on ship HUD. Increased guidance for finding Convergence Cubes as part of the scientist mission. Prevented some tutorials (for example for life support) from being shown in your log. Prevented Artemis being visible in the holohub after they should have left. Protected against some cases where missions can send you to depot which has already been destroyed. Improved binocular scanning for background objects. Prevented binocular scanning flicking between multiple objects. Added ability to scan all building types and fixed their displayed names. Added ability to scan ships. Fixed text truncation on binocular HUD. Added the option to display temperatures in Celcius, Fahrenheit or Kelvin regardless of locale. Fixed display of longer planet names on the discovery page UI. Added ability to cancel in progress missions. Added faction icons on the galactic map. Improved ship handling when booster upgrades are installed. Fixed mission notifications showing an incorrect icon for Electron Vapour. Fixed an issue where portals you’ve returned through could not be updated to a different address. Improved visuals around icons for different inventories. Added joypad and keyboard controls for switching between inventories. Fixed galactic map showing joypad prompts for changing filters when playing on mouse and keyboard. Fixed issue where players could lose the teleport destination they needed to complete the Mind Arc mission. Fixed players getting stuck in an interaction with the armourer if they hadn’t yet built a terminal. Fix for visual artifacts from transparent objects showing through the warp effect. Reduced cases where terrain editing changes are lost when reloading a save. Reduced difficulty of the final armourer mission. Improved low flight mode handling. Fixed crash in string translation when loading certain saves. Added missing scan event icon to the Antimatter tutorial. Fixed terrain editor being built with full charge. Fixed occasional hang in displaying some multi-byte characters. Improved saving and loading of terrain edits. Fixed issue where upgrading from a previous save would cause player bases to be floating or underground. Fixed very occasional crash in rendering. Fixed occasional crash relating to destructible objects. Prevented the interaction camera occasionally triggering at inappropriate times. Fixed the Farmer displaying the wrong text for their final mission. Prevented pinned missions occasionally being deselected on warp. Fixed issue where players could become stuck in the final atlas station. Improved automatically selecting missions from NPCs in your base when they begin. Improved pricing of base building parts in normal mode. If you’re experiencing any further issues in the game, report them to Hello Games. Fixed an issue that could cause cargo slots not to unlock after purchase. Players who had previously learned all alien words are now able to progress through the story. Players who’ve unlocked all general exosuit slots can now unlock tech and cargo slots as intended. We’ve fixed an issue that caused base NPCs to stop responding after claiming a new base location. This will prevent new occurrences of the issue, a fix for those who have already experienced it is under investigation. Fixed an issue preventing players from being able to finish farmer and exocraft missions. The base terminus teleporter will now display mission objectives, allowing you to select the correct system. It will also no longer ‘forget’ mission critical systems. This will prevent new occurrences of this issue and a fix for those who’ve already experienced it is under investigation. Creative mode players no longer need to complete mercenary missions as part of the story. Fixed a rare issue causing multiple ships in a freighter to spawn on top of each other. Custom waypoints will no longer override the Atlas Path in the Galactic Map. take missions from those NPCs as soon as they are at their terminals. Fixed an issue that allowed players to miss Atlas Stations, which prevented progress. This will prevent new occurrences of the issue, a fix for those who’ve already experienced it is under investigation. Fixed an issue causing waypoint lines not to draw in the Galactic Map. The power of Analysis Visor upgrades has been significantly improved, resulting in much higher rewards when scanning with Flora or Fauna upgrades. 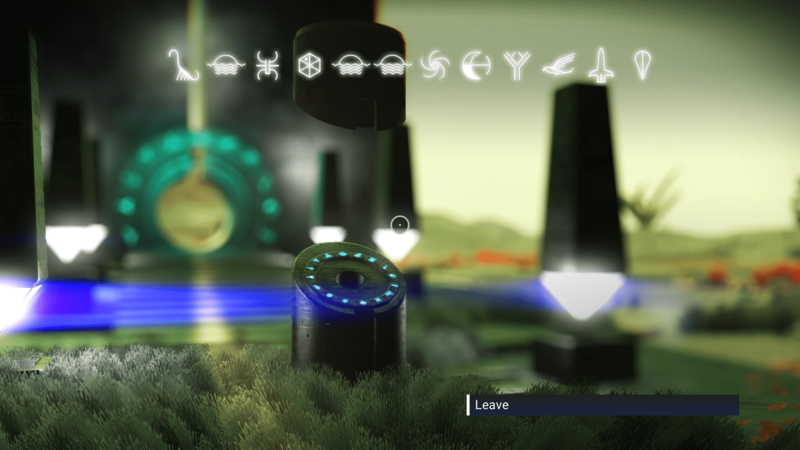 Here is my portal address in my home system. It isn’t on my Base planet, as my base planet got changed in the new update, but it’s in the same system. If you have any cool screenshots from you have taken from the Atlas Rising update, please submit them to us. I would love to share them with everyone else. Also, if you have found a portal, take a screenshot of your coordinates and send them to me as well. Click the link below to submit your screenshots. 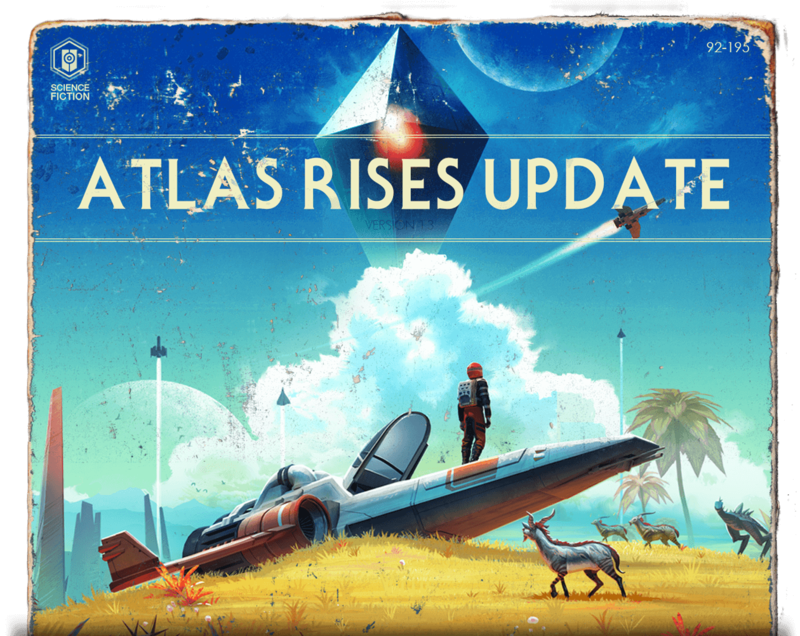 Update 1.3 Atlas Rises is Here! Update 1.3 finally brings us the game they were originally showing us 2 years ago. Well, it’s a lot closer than it was. They have added SO much to this update, it really does seem like a completely different game. Click the link below to visit the official No Man’s Sky site and look for yourself at all the game changing stuff added. Watch this video for a small glimpse at just some of the changes. The new 1.3 update is supposed to be coming sometime this week. It is supposed to add new content and active portals. It should be interesting for sure. Hello Games announced the new Pathfinder update for No Man’s Sky. This week Hello Games will be releasing the next content update for No Man’s Sky. 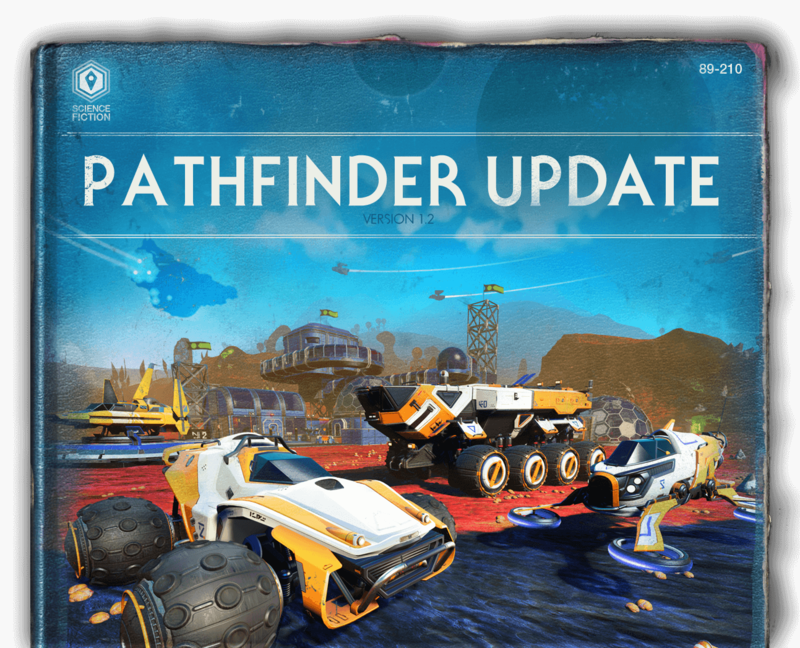 We’re calling it the Path Finder Update; it introduces a new vehicle that will aid home planet exploration, building on the Foundation Update to hint at a path ahead for the future. Detailed patch notes will be released when the update goes live. Shortly after we launched the Foundation Update, we released a number of patches to address issues reported by players before beginning work on the Path Finder update. We were surprised and excited by the response to Foundation, and we have been listening carefully to community feedback since then. To those of you who have spent time sharing feedback, whether positive or negative, we are listening. This is the next step in our journey. It shows the path forward. We hope you’ll join us. Click the LINK to go to the official No Man’s Sky website for more information on the update. Sean Murray will make his first public appearance at GDC since the game No Man’s Sky was released. Hopefully there will be news of a future update for the game. Click the link below to see the schedule of his appearance. Merry Christmas everyone! Have a happy new year and here’s hoping 2017 is a great year for No Man’s Sky! The Foundation Update Ver. 1.1 is out! The new update for No Man’s Sky is out now on PC and PS4 called the Foundation Update Ver. 1.1 and it adds a bunch of new features and content to the game. Normal mode: is the original chilled exploration experience. Creative mode: allows players to explore the universe without limits, and build a huge base. Survival mode: really changes the game, creating a much more challenging endurance experience. Players can build a base to suit their needs for storing resources or creating a farm. You can even hits NPC aliens to run the base for you and much more. Purchase huge interstellar Freighters at great expense, and then summon them from anywhere in the galaxy. Ethan is a young YouTube gamer who is playing No Man’s Sky. His videos are better than some adult players I have seen. Check out his videos and give him a like and subscribe to him. Click the link below to visit his YouTube channel.